It’s May of 2012 and we have six months to take a message of reform to the people of this country. In 1980, Ronald Reagan asked a simple question to the American people – “Are you better off today than four years ago?” America at that time was buckling under high unemployment and suffering because of the policies of a president that was in over his head. It’s May of 2012 and we have six months to take a message of reform to the people of this country and all of us need to do our part. Now is the time to get organized on the home front. All too often we think about a Presidential election year solely in terms of the race for the White House. When we do that we miss the big picture. Sure, making certain that we have leadership in Washington that’s going to Keep America Free through a renewed focus on the Constitution, less spending, smaller government and individual freedom is critically important. But just as this country was founded on the principles of an individual’s power to achieve, so too our ability to save America from statism rests on our individual efforts. In fact, we could solve many of our problems in Washington and still face fiscal crisis due to government gluttony and overreach. Local and state-level spending, taxation and debt are in fact one of the largest portion of our problem nationwide. We need to start cultivating new conservative leaders, supporting conservative campaigns and organizing for victory today in primary contests from school board to state senate in order to ensure real change that works bubbles up from our neighborhoods to impact the nation. And let’s be honest: national, generational change does not begin at the top. It begins at the local level. Last year American Majority launched the New Leaders Project to encourage local activists to look at the big picture – not just one level of government or one election for that matter but developing a new generation of American leadership. We challenged conservative grassroots groups across America to take the New Leaders Pledge to identify 10 people in their local community who can be groomed for leadership of some kind. To date, more than 500 groups have committed to recruiting more than 5000 new, conservative leaders to help drive forward the kind of reform you and I know is needed in America. For our part, American Majority committed to training all these folks and providing the latest campaign management technology platform called Gravity, to their local grassroots groups to help make them more effective at winning the battle of ideas in our communities. Sign the pledge today and be a part of a new wave of principled, liberty-minded leadership for America. We have six months to fight this fight and win for our future. Our mission is the preservation of freedom and the restoration of American values. Right now, it’s incumbent upon all our grassroots groups across America to being identifying campaigns and districts where outreach can be done directly to voters who will respond to our message that places people – not government – first. We strongly encourage you to have a leadership meeting this spring to plot a strategy for identifying those audiences who need to know about how debt and taxes are crippling our nation. Start a volunteer drive for those willing to pass out literature and canvass neighborhoods. Then use technology like Gravity or updated voter data to start mapping out where you can hit most effectively. We are six months out from the election of our lifetime. We’ve seen the damage done in just a few short years, now we have just a few short months to prepare. For more information about having an American Majority training in your area visit us at AmericanMajority.org. 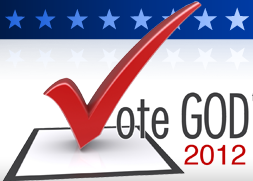 Beyond finding candidates, another task as the 2012 elections approach is to find new voters to help Keep America Free. That's where the new Map Widget at Pledge to Vote comes in. All the prospective voter has to do is choose the right state, and voter registration information pops right up. "Chris Koerber and his wife, Halcyon, attended an American Majority candidate training during the Summer of 2010.... Yesterday, Chris was sworn in as the most recent Sierra Madre City Councilman. He is now one of 5 city council members governing a budget of over $20 Million and 67 City employees."